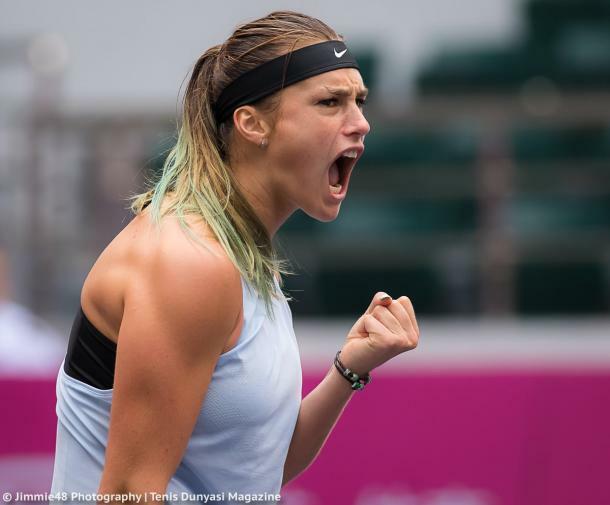 Aryna Sabalenka was simply firing on all cylinders after defeating former top-five player Sara Errani in the semifinals of the Tianjin Open, sealing a place in her first ever WTA final. 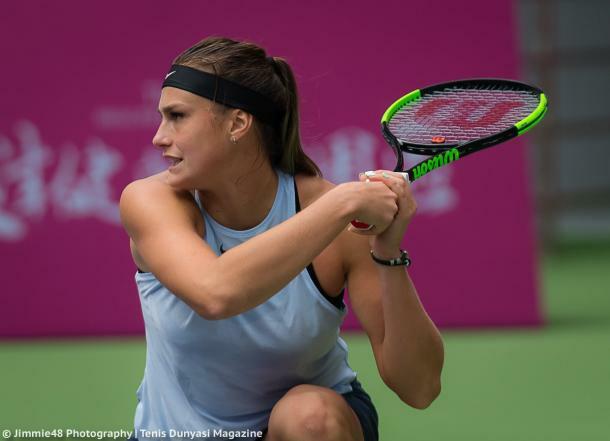 Aryna Sabalenka’s impressive run at the Tianjin Open continued after she steered past Sara Errani easily in straight sets and managed to reach the first WTA final of her career, where she would face former world number one Maria Sharapova. 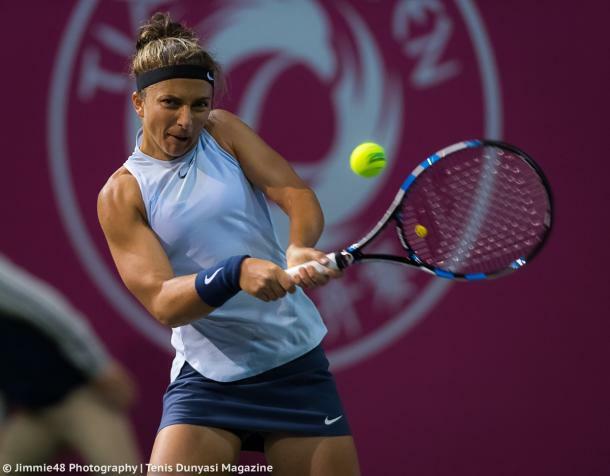 Errani was playing in her first tournament since her ban for violating the anti-doping rules, and she had to get through the qualifying rounds to do so. Sabalenka, playing with great confidence, ousted the Italian without facing many problems as the Belarusian was just too good today, looking very impressive. Sabalenka’s aggression was immediately reflected in the first point of the match, firing down an ace to claim the point. Playing in just the second WTA semifinal of her career, the Belarusian almost fell victim to her early jitters but she eventually managed to overcome the nerves and clinch the confidence-boosting hold of service in the opening game. Errani was simply helpless when faced with the ruthless aggressive play from Sabalenka, who controlled play from the start to the finish. Her powerful and consistent groundstrokes were met with the stubborn defense of Errani, but the Italian eventually found herself trailing 0-3 within a blink of an eye. The 2012 Roland Garros finalist finally got herself onto the scoreboard with Sabalenka having several mishits on the return, and Errani desperately needed this service hold to gain some momentum. Nonetheless, Sabalenka continued to dictate play against the defensive Errani, sealing a love hold for a 4-1 lead. The Italian’s serves were once again her downfall as the youngster had no troubles hitting powerful winners off them, with the Belarusian eventually sealing the first set 6-1 easily after just 27 minutes of play. Errani had the worst possible start to the second set as Sabalenka continued to stroll through the encounter, sending in three consecutive return winners for the early break. Surprisingly, the Italian was able to break straight back as she benefitted from some unforced errors by her opponent, leveling the scores as she threatened to mount an incredible comeback. Sabalenka regained the lead with as she was able to regain her composure quickly, with her aggressive tennis wowing the crowd in Tianjin. This time, the Belarusian was able to consolidate the break with a comfortable service hold, which turned out to be the only hold of service in the second set, opening up a 3-1 lead. Sabalenka looked on course for the comfortable victory after she broke once more and edged closer to the finishing line, with Errani’s serves being her main weakness. Within a blink of an eye, Sabalenka found herself serving for the match with her ability to hit winners after winners but she was unable to remain focused with all the pressure weighing on her shoulders. Errani managed to retrieve one of the breaks back, but Sabalenka ultimately proved too strong for the experienced Italian as she prevailed with a straightforward 6-1, 6-3 scoreline.